that special time of year. for you, anyway. 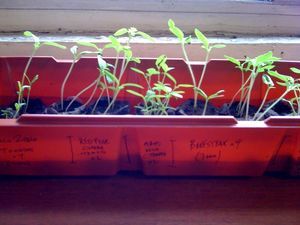 I really am happy for all of you that can start planting your tomato seedings right now. I am. I’m not bitter or jealous. Maybe I’m envious, but in a good way. I mean, I know I have a good life, even though I can’t even entertain the idea of growing my own tomatoes. Even if I moved, like actually sold my home and bought one with a garden that finally got some sunlight, it would still have to be in a neighbourhood where gangs of raccoons and squirrels didn’t feel entitled to eat one single bite out of every just-blossomed fruit, then toss it aside and make a home in hanging pots. 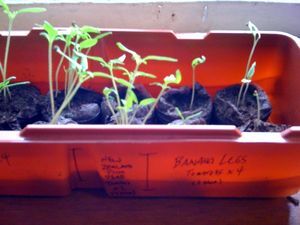 I’ve almost forgotten exactly how much I spent on containers, organic soil, seedlings and chicken wire for protective cages in previous vain attempts. But back to all of you. Good luck with your tomato plants. I’ll go buy my expensive, heirloom varieties at the market and do my part to support the farmers. Ok then. she will never hear of it from me, blake!